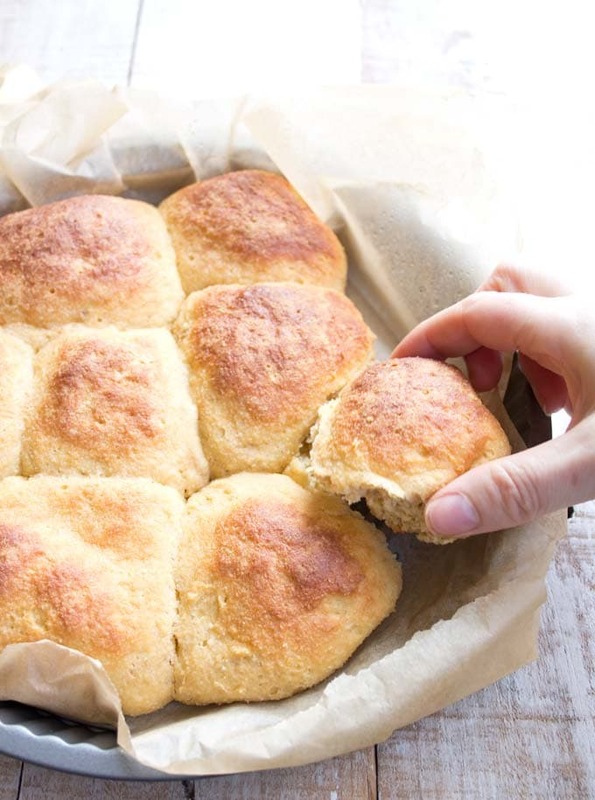 These pull-apart Keto bread rolls are made with yeast, which makes them pillowy-light and extra fluffy. They’re delicious at breakfast with some sugar free jam and work equally well as light low carb buns with lunch or dinner. German babies are pretty much born with a bread roll in their hands, and I am no exception. When I was little, my breakfast of choice were “milk buns”. 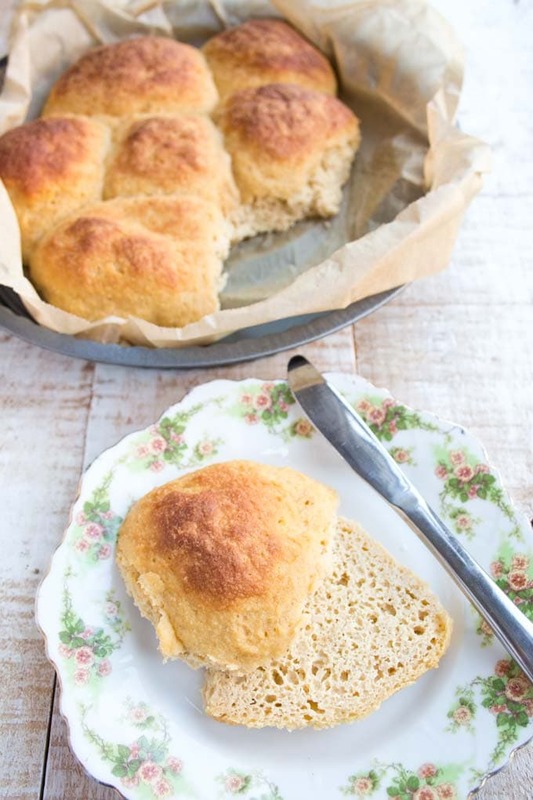 These were sweet, airy white rolls made with milk and yeast, a bit like brioche or challah. I’d devour them for breakfast! I’ve published a whole bunch of great bread and roll recipes on this blog already. They range from extra rustic (such as this Paleo bread – omg it’s divine when sliced thinly and toasted) to extra versatile (such as my almond flour bread and this low carb bread – both are perfect for sandwiches). The one thing I felt was missing was a healthy gluten free remake of my beloved milk buns. And after a bit of experimenting I’ve come up with a low carb, grain free recipe that is a worthy substitution! Yeast, as we all know, is a living thing. It feeds on the sugars in the ingredients, emits carbon dioxide and thus the dough rises. Traditional milk buns contain wheat, milk and sugar. Plenty of sugars there. So how do you make a bun rise using low carb ingredients such as almond flour? I settled on a prebiotic, soluble fibre called inulin. It is gently sweet (great in yoghurt, by the way) and has a whole bunch of amazing health benefits. Here’s an informative article. 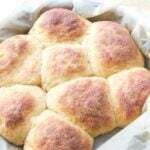 Inulin is FANTASTIC to make low carb yeast dough rise. Shall we get started? 1.) First, proof your yeast. We want to make sure it’s working and activated – and if it doesn’t, we can start all over again without having to throw away expensive ingredients or having to eat tiny, hard rolls! You simply mix the yeast with warm water and inulin. Cover your bowl with a kitchen towel and put in a warm, draught-free place for 5-10 minutes. This could be above a radiator, on top of your oven or even inside your boiler cupboard. See the froth and bubbles in the image above? That’s what needs to happen. While you are waiting for the yeast to proof, combine all dry ingredients in a separate bowl and set aside. 2.) 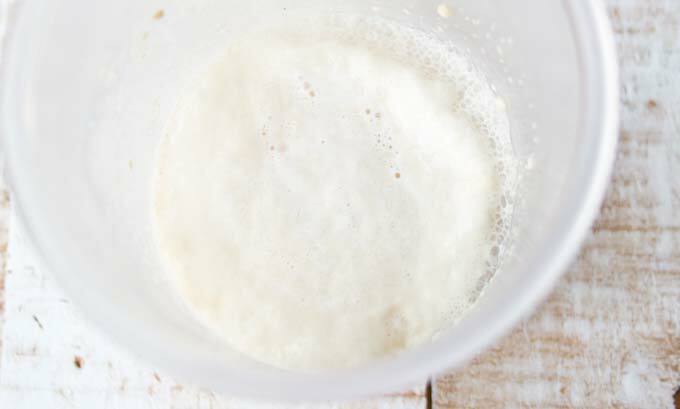 Once the yeast is proofed, add it to your eggs, egg whites and melted butter and blend well. The correct temperature of the ingredients is essential. Your eggs must be room temperature. Also, make sure that you give the butter time to cool down so it’s only lukewarm and not scalding hot. Yeast thrives in a warm environment. If it’s too cold or too hot, they can die off and your rolls simply won’t rise. 3.) 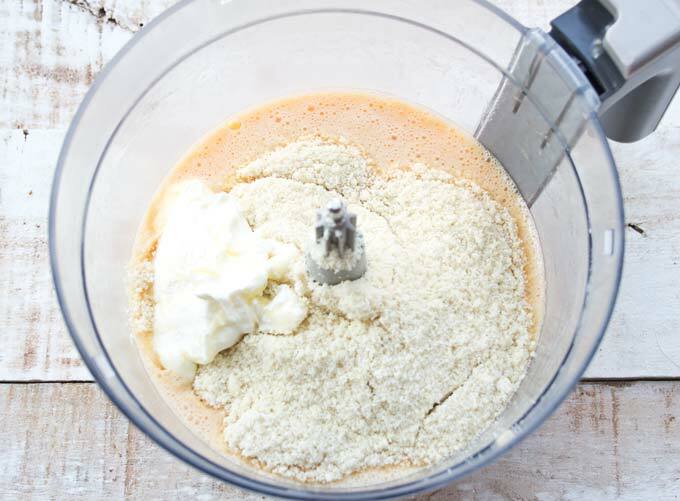 Now add the first half of the dry ingredients – whey, almond flour, psyllium and baking powder – plus the Greek yoghurt. Blend until combined, then add the second half of the dry ingredients. The dough thickens really quickly. 4.) This is what it should look like – sticky and rather firm. Time to work rapidly now, so the dough does not cool down too much! 5.) Line a baking tray with parchment paper. I used a regular sized pie dish, but a rectangular casserole dish would work just as well. 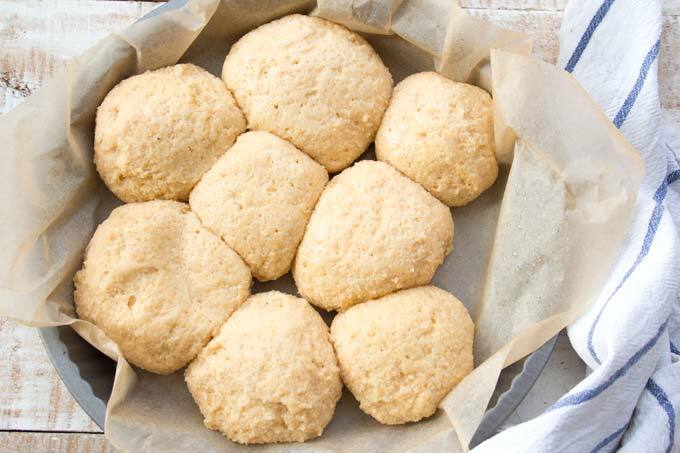 Wet your hands so the dough doesn’t stick too much and form 8 balls, leaving space around the Keto bread rolls because they will double in size. Cover again with your kitchen towel or, even better, with a lightly oiled piece of cling film first and then with the kitchen towel (less chance of the dough drying out). Aaaand – place the lot back in your warm place of choice for 50-60 minutes to let the dough rise. 6.) Time for the yeast rolls to go into the oven! I recommend to bake them for around 15 minutes or until lightly browned, and then add another 7-10 minutes loosely covered with aluminium foil. Total baking time should be ca 22-25 minutes. Note – I did NOT cover the rolls in the images and find they turned just a little too dark for my liking. Covering them with a foil dome should make them just perfect. Getting hungry? I could have a second breakfast just looking at these pics! Honestly, this is a NO SHORTCUTS recipe. You really must proof the yeast to be 100% sure it’s activated. Also, take your eggs out in time so they’re room temperature by the time you mix the dough. And leave your butter to cool down after you melt it. Trust me on this one. I made my Keto hot cross buns (a very yummy low carb version of the British Easter staple) using the same basic recipe and my eggs were still on the cool side. The result? The buns were AH-MAZING, but did not rise as much as these fine specimen in this post. If you don’t have inulin, you can use either honey or maple syrup instead. 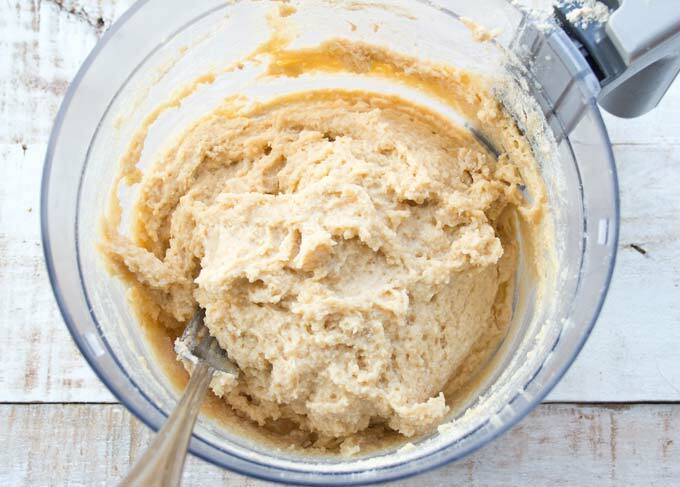 Yeast bacteria feed on the sugar to thrive and in theory there won’t be much of the sugar left once your dough has risen. I cannot guarantee that ALL sugar will be gone, but it’s likely that most of it would have been gobbled up! Many people don’t like or cannot have almond flour. I have not tried this recipe with coconut flour myself yet, but normally halving the amount of flour works well – in this case, use 100g / 1 cup of coconut flour in place of the almond flour. This is because coconut flour absorbs more liquid than almond flour. I made these Keto buns with ground almonds, which is equivalent to regular almond flour in the US. If you want to use extra fine almond flour, I recommend that you start off with 1 3/4 cup of almond flour. This should be sufficient to achieve the same dough consistency you can see in image 4. You could use sour cream in place of the Greek yoghurt. Coconut yoghurt would also work – i.e., yogurt made FROM coconuts, such as by the Coconut Collaborative. If you wanted to use coconut cream, add 1 tsp of apple cider vinegar as well. 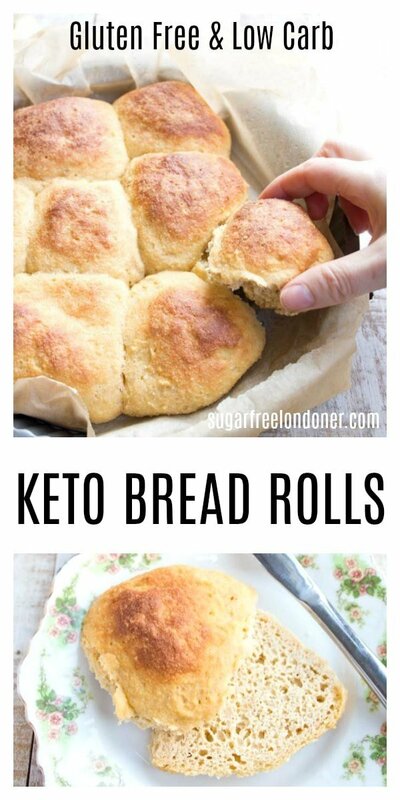 These Keto bread rolls remind me of the sweet milk buns I used to love as a kid. Because of the yeast, they rise a lot and become airy and light. We all thought they were a pleasure to eat! The recipe uses almond flour and is low carb, gluten and sugar free. Proof the yeast! Put the yeast and inulin into a bowl and add the warm water (40 Celsius / 105 Fahrenheit). If you don't have a thermometer, the water should be warm to the touch. Cover the bowl with a kitchen towel and leave in a warm place for 5-10 minutes until it starts to froth and thicken. In the meantime, combine the dry ingredients - almond flour, protein powder, psyllium husk powder, baking powder - in another bowl and set aside. 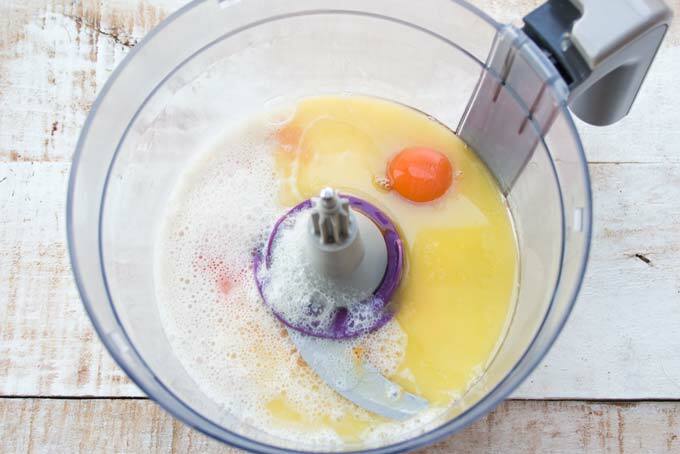 Using an electric mixer or a food processor, whisk the room temperature eggs and egg whites, melted (warm, not hot!!) butter and the activated yeast mixture until well combined. Add the yoghurt and the first half of the dry ingredients mixture. Blend until combined, then add the second half of the flour mix. 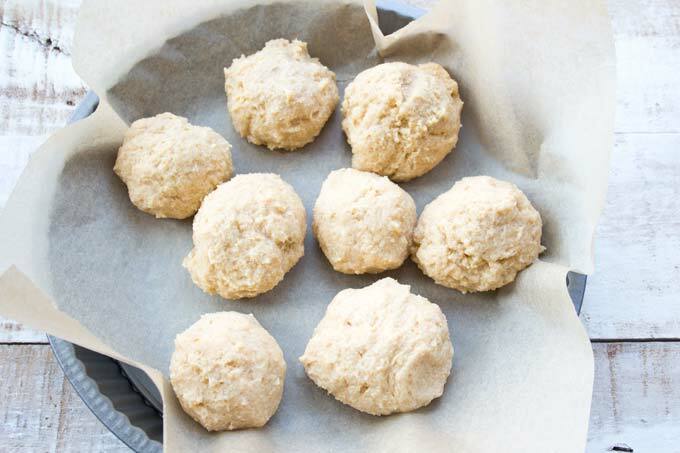 The dough will thicken quickly as the psyllium and the almond flour absorb the moisture. Line a pie dish or a casserole dish with parchment paper. Lightly wet your hands and form eight dough balls. 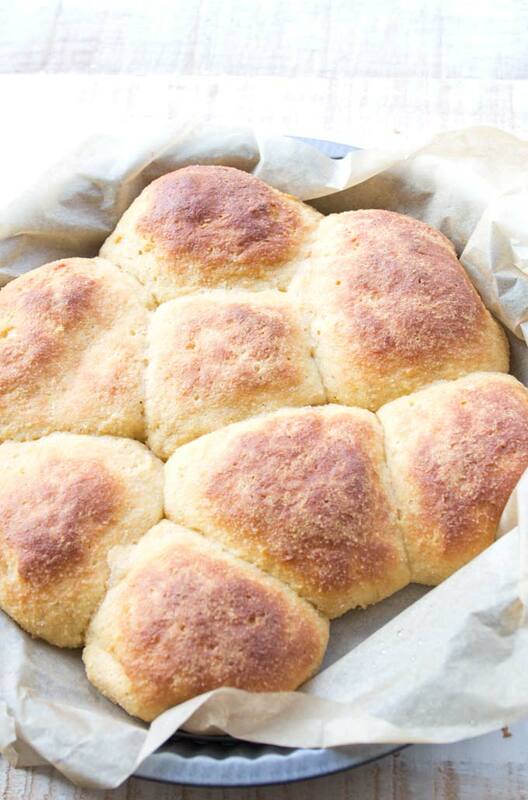 Make sure you leave some space around the rolls as they will significantly increase in size. Cover the dish with lightly oiled cling film and a kitchen towel and return to a warm space for around 50 to 60 minutes until the rolls have substantially expanded - see the images in the post. I like to place my tray on top of the radiator. Towards the end of the rising time, pre-heat the oven to 175°C/350 Fahrenheit. Bake for around 15 minutes or until the rolls are starting to brown. Then cover loosely with aluminium foil and continue to bake for another 7-10 minutes. Do not take shortcuts with the temperature of the ingredients! Yeast can die if the environment is either too hot or too cold. So make sure your water is WARM, your eggs are ROOM TEMPERATURE and the melted butter is WARM and NOT scalding hot. To make sure the yeast is activated, we're proofing it. Don't miss this step. It should bubble, froth and thicken. If it does not, start over with a fresh batch of yeast. You don't want to end up with tiny, hard rolls. If you are baking at high altitude, increase the oven temperature to 190 Celsius / 375 Fahrenheit. This recipe is high in fibre - the fibre count is higher than the total carbs. Normally we would deduct the fibre from the total carbs to calculate the net carbs. Since we cannot have negative net carbs, we need to take into consideration the sugar content, which comes in at 1.8g. Do the egg whites get beaten first before adding them to the other wet ingredients? I have made the recipe twice – once I added the eggs together with the yeast water and butter and beat all together, as in the images, the next time I beat the eggs (including the yolks) first, then added the other wet ingredients and beat again. Both end results were the same. I have not tried beating the egg whites on their own. They were just horrible. But I have to say this recipe is delicious!!!! It’s just like having homemade regular bread. I’m so glad you like the recipe Sonya!!!! I rated them 5 star cuz it came out as the closest thing to “real” bread that i have come across in a year of keto. I think the taste wasn’t exact match of course but I figure once I make into a sandwich or whatever, it will be great. Thank you so much for sharing this recipe. I used 1 tbsp of collagen powder (non-flavored) and 2 tbsps of protein whey powder. I cannot guarantee that any substitution will work, because I have not tried it myself. You could try replacing with egg white powder or an additional 1-2 egg whites. If you try the egg whites, I’d beat them until stiff and mix them in last. That way, the dough will be less runny. Also, extra fine almond flour may be a better option than regular almond flour/ground almonds. I’d be very interested to hear how you get on if you try. Hi, these look delicious! I’m on my 3rd week of Keto & 4lbs down… 3 Tablespoon of Yeast? Seems like a lot? Or did I read this wrong? Love your Lemon Sponge pudding by the way; I add blueberries to the batter. Delish! This looks AMAZING! I plan on making them this week. I’m in my second full week of Keto and down 5 lbs already. I’m hoping that I can add these to my diet. Can you tel me how many carbs each roll yields? I didn’t see that info in this post. Also, when you call for Greek yogurt I assume it’s just plain full fat. Is this correct? Thanks so much. Hi Kelly, glad you like the look of the recipe. The fibre count in this recipe is actually higher than the total carbs, because of the psyllium and the inulin (the nutrition panel is below the recipe card). When this happens, I always look at the sugar content, which comes in at 1.8 g per roll. Hi Heather, good to see you here. I’m really impressed with the inulin. It’s not cheap, but works so well in this recipe and I like its gently sweet taste.